The talk of rain ahead of the German Grand Prix came to naught, and the weather held off for the racing to continue unhindered. Despite that, there was still chaos and we saw a first lap crash, a fire, plenty of overtakes, lots of side by side action and a couple of three-way fights going into tight corners. It was a hectic race, ending in perhaps an expected result, but one that was a joy to behold. If you're looking for a recap of what happened, or hoping to pinpoint on exactly which lap an incident occurred, this Factbyte Factbox replay should be just what you need. Felipe Massa crashes out of the race after turn one collision with Kevin Magnussen. Lewis Hamilton collides with Jenson Button, damages front wing, has to adjust to three stop strategy. Romain Grosjean retires with a lack of power. 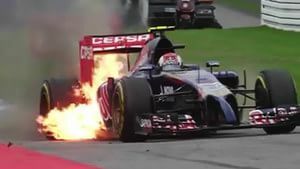 Daniil Kvyat's Toro Rosso spectacularly catches fire, leaving him punching the armco in frustration. Adrian Sutil spins on the home straight, leaving the Sauber beached on the grid. Nico Rosberg wins, as Bottas holds off Hamilton to take second place. Hello FBFB fans, looking forward to the race? You better had be! This is the German Grand Prix, a race of two destinations. 2014 is all about Hockenheim, and so far we've got everything in place for a good race. Drivers are out of position, pre-race penalties are already taking effect, and there's a continuous talk of rain. I must point out that if it does rain, or if Kimi Räikkönen repeats his one-lap pirouette here, or for any other reason there's a delay, you might find the FBFB stops abruptly mid-sentence. I've a specific deadline today, and am hoping that F1 doesn't over-run. It's hard to type with all my fingers crossed, you know. Anyway, if you're up for a bit of starting grid news, we initially thought it would look something like this. However, it's just emerged that Marcus Ericsson is in trouble already. 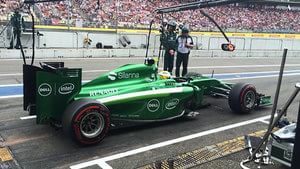 The Caterham driver has to start from the pit lane and take a 10 second stop/go penalty due to breaching parc ferme protocol. The official FIA document states: "The team failed to cover and seal car 9 at 18:39. 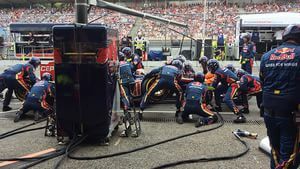 The reason for the dual penalties is to serve as a disincentive to a breach of Parc Fermé resulting in unsupervised access and significant extra time to work on a car." That's after Ericsson failed to qualify due to a hydraulic problem, and he also had little running during final practice. And Kamui Kobayashi had to put out a fire on his car, so it's not a good weekend for Caterham at all! Tweet from @CaterhamF1: Last time @Ericsson_Marcus started from the pitlane was Monaco where he finished 11th..... c'mon Marcus...repeat plus a couple more please! 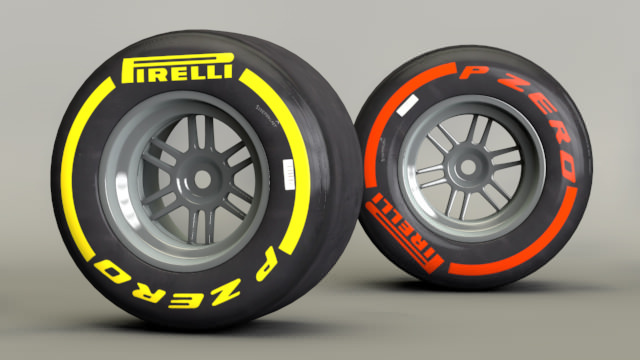 Depending on the weather, of course, these are the two tyres we'll see in action this weekend. Soft and supersoft compounds. They weren't dealing very well with the high temperatures yesterday, but it's somewhat cooler on track at the moment. Lewis Hamilton as he made his way to the grid: "I am fortunately in one piece. A bit stiff today, but good. It’s different scenario to the last race. When you make mistakes and lose it’s different. But it’s still gutting, we had good pace today and I was hoping for a better qualifying than I’ve had for a while. I’ll definitely have a race, which is great. We’ve got a great car, I just hope I can get some points for the team." Hamilton suffered a huge crash yesterday due to a brake failure, and he starts down in 20th due to a gearbox change upon rebuilding the car. It's going to be a challenge for him to fight his way through the field unscathed, although he's got the fastest car beneath him. How far can he get? Kevin Magnussen cool and calm on his way to the grid: "It depends on the weather. There’s a chance of rain so it could be dry or wet, so it could be quite an exciting race. I think if we can fight the Williams, we would be very happy. I don’t think that’s realistic, I think we probably got more out of qualifying than we could in the race. If we can keep our position or top five, we should be very happy." Claire Williams discusses their strategy with Natalie Pinkham from Sky Sports F1. The team will fight for the best results possible but don't want to risk everything for a win. Cars are leaving their garages and lining up at the end of the pit lane for some practice starts. It's slow going getting out of the pit lane at the moment! Nico Rosberg's brakes smoke ominously as he joins the queue waiting to get out on track. Daniel Ricciardo on his fifth place grid spot: "We did expect a little bit better. Fifth was the best we could do and the lap was alright. We expected the top from that, but that’s what it is. There’s a bit of rain expected so that could spice things up. As we saw with the GP2 race, it’s a real mixed bag. It’s just about being smart, being on the right tyre at the right time and staying out of the trouble." Jenson Button heads to the grid, the Brit lining up in 11th place. He was disappointed with the qualifying run, particularly as teammate Magnussen is up in fourth. Christian Horner: "We’re very quick in the first and third sector, it’s the one in the middle where we give half a second away, where the straights are. I think we’ll be a bit more competitive in race trim." There are varying degrees of forecast in terms of rain affecting the race, but almost everyone agrees it will be later rather than sooner, and the start should get underway without any precipitation. Tweet from @alanbaldwinf1: A lot of empty seats out there. But looking on the bright side, means fewer fans will get soaked when it tips down in about an hour's time. Final preparations underway on the grid, mechanics poised with the tyre blankets on, as the minutes tick down to race start. Hülkenberg team radio informs him there's a strong wind, 15kph, pushing behind them into the first corner, so look for early braking when the race starts. The top 11 drivers are all on supersofts, with Kimi Räikkonen, Romain Grosjean and Lewis Hamilton the only three to start on the soft compounds. The grid clears for the formation lap, and Nico Rosberg leads the field away for their installation tour of the track. Tweet from @Martini_drinks: We can hardly hear the engines over the sounds of our hearts. Go boys go! #WILLIAMSMARTINI racing. Rosberg rounds the final corner to take up his front row grid slot. The pack forms up behind him, with final weaving movements to the grid spots. One of the Marussias got a very slow getaway at the back. Massive crash at the first corner, for Felipe Massa and others. Massa was upside at one point there, but he's out of the car okay. Luckily it wasn't gravely there. It was a collision between Massa and Kevin Magnussen, the McLaren is still running, heading into the pit lane with some tyre damage. Replays of the start show Jules Bianchi was the Marussia getting that slow getaway, but he's running okay now. It was just into the first corner, Bottas swept in front, Massa moved across and Magnussen was on the inside for them to come together. Hard to assign blame on that one. Massa was upside down, kicking up heaps of sparks as he spun across the tarmac, but flipped back up the right way when the Williams came to rest. Seeing the accident unfold, Daniel Ricciardo had to take a hugely wide line round the corner which has dropped him all the way back to 15th place. The safety car comes in and Rosberg leads the pack away, dashing ahead to form a gap almost immediately. Lewis Hamilton is sweeping through the field, as you might expect. He's already dispatched the four backmarkers, and has now got Pastor Maldonado in front of him. Actually, scratch that. He now has Pastor Maldonado behind him. Jenson Button is hustling Nico Hülkenberg for fifth place, he tries the inside line but has nothing, takes the outside line around the next corner but still can't get past. Marcus Ericsson has taken his 10 second stop/go penalty, currently last. Turn 1 incident under investigation. Team radio to Daniel Ricciardo: "Okay Daniel, let's get through these cars as soon as you can. Next car behind you is Hamilton, he has made his way through the traffic." Ted News: Ricciardo was complaining that Maldonado was overtaking under yellow flags. And possible Magnussen as well. Turn 1 incident - no further action warranted. Daniel Ricciardo passes Adrian Sutil, and Lewis Hamilton takes the opportunity to barge his way through on the inside as well. The Sauber and Mercedes touch slightly but no damage done. Nico Rosberg sets the fastest lap of the race so far, with almost 5 seconds up on second place Valtteri Bottas. Ricciardo is reminded he can use his overtake button to defend from Hamilton as well. The out of position Red Bull will hinder Hamilton's comeback here. Nico Hülkenberg complains of "incredible" understeer, but the Force India driver is still managing to keep Jenson Button behind him. Yellow flags as Daniil Kvyat spins off track trying to pass Sergio Pérez. He's back on track, with a lot of paint on those wheels. Replays show Kvyat trying to take the outside line and he just squeezed the Force India too hard. Kvyat heads straight into the pit lane for a fresh set of tyres. He's lost heaps of time and places now, very disappointing. Daniel Ricciardo and Lewis Hamilton are up to 9th and 10th place, but still in that order, despite the best efforts of the Mercedes driver. Hamilton pulls to the side of Ricciardo and looks like he's going to outbrake him into the hairpin, but Kimi Räikkönen was firmly in the way, there. Ricciardo managed to get past the Ferrari, with Hamilton left behind to hassle Räikkönen into the stadium section. Amazing amounts of driver skill being shown, as they are side by side on track and not in any danger of crashing. Ricciardo hasn't had the chance to get some air between himself and Hamilton, as the Red Bull is stuck behind Sergio Pérez now. As we've seen, the Force Indias are very hard to pass. Fernando Alonso pits from P4 to change to the harder of the two compounds, the soft tyre. Hamilton bumps his way past Kimi Räikkönen, with contact and bodywork flying off both cars. The Ferrari pushed Daniel Ricciardo off track as well, allowing Lewis to get through and up into fifth place. Super slo mo replays show how trashed Hamilton's tyres are, after he locked up trying to pass Kimi. Daniel Ricciardo comes into the pits for a change of rubber, as does Jenson Button who suffered an almost six second stop. Felipe Massa is back at the Williams motorhome, presumably after a quick stop at the medical centre. Vettel and Alonso stumble upon a struggling Kimi Räikkönen who gets sandwiched yet again! Both cars managed to get past, with Vettel staying ahead. Räikkönen was bouncing between both the cars there, and may have lost some carbon fibre for his trouble as well. So, Hamilton is up to second place already, although he's the only man of the top five who has yet to stop. Most of the drivers are on the soft tyres at the moment, except Pastor Maldonado up in 8th and yet to stop, plus Jules Bianchi and Esteban Gutiérrez. Marcus Ericsson also has the supersofts on. Ricciardo is getting some warning radio traffic, with words like "fail" and "upshift". We'll see if it has any effect on his lap times. Team radio from Valtteri Bottas: "Small drops of rain on visors." The team respond there is nothing major on the radar though. The Toro Rosso boys get to work in the pit lane. Both drivers have stopped once, Jean-Éric Vergne up in 12th place, with Daniel Kvyat the biggest loser so far down in 16th. Bottas has made his way past Hamilton for second place, as the Mercedes driver was informed not to battle too hard with the Williams - he's still forecast P2 by the end of the race, apparently. Kimi Räikkönen dives into the pit lane for his first stop of the day. He takes on the supersoft compounds. Daniil Kvyat runs wide which gives Pastor Maldonado the opportunity to pull alongside, take the inside line into the following corner, and eventually move up to 15th place. The other Lotus of Romain Grosjean flies past Sergio Pérez, but it is not for long, as the Force India regains the position from the Lotus. This is the battle for 11th place. Hamilton is making his tyres work really well today. He and Romain Grosjean are the only two drivers not to have stopped yet. Team radio to Sergio Pérez: "Checo, we need to lift and coast, please. We can't be certain about the rain at this stage. We cannot rely on the rain. So please lift and coast. It's the last time I'm gonna ask you, okay?" Turn 6 incident involving Romain Grosjean and Jean-Éric Vergne under investigation - leaving the track and gaining an advantage. Romain Grosjean pits for the first time this afternoon. Meanwhile, Pérez is presumably taking his engineer's advice and lifting and coasting, which has allowed Kimi Räikkönen to get in front of him for 11th place. Lewis Hamilton was told to adjust the "menu magic" button, but the driver responded: "I've never heard of that switch." Kimi Räikkönen's super soft tyres are really working for him, the speed of the Ferrari has picked up and he's flying through the field. Up to ninth now. Lewis Hamilton pits for his first stop of the day. He comes in from third place, keeps the soft compounds on, and rejoins in eighth place. 5 second stop/go penalty for Jean-Éric Vergne - leaving the track and gaining an advantage. Yellow flags as Romain Grosjean has stopped at turn two - "a problem with the power." Hamilton is back behind Daniel Ricciardo again, with all the work to do from earlier all over again. 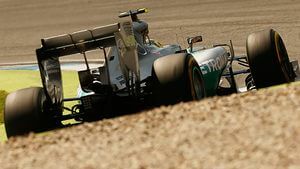 Three drivers have been lapped so far, with Kamui Kobayashi, Max Chilton and Marcus Ericsson being passed by Nico Rosberg. Hülkenberg is instructed to, basically, wobble all the switches until they start working. His hand gestures suggest they are not. It didn't take long, a nice neat pass for Lewis Hamilton to get ahead of Daniel Ricciardo and sit snugly in seventh place. He's got Jenson Button just half a second ahead of him. There's contact between Hamilton and Button as the Mercedes takes the inside line of the haripin against the McLaren. Front wing damage for Hamilton. Team radio from Lewis Hamilton: "Damaged my front wing, I thought he was letting me past." Hamilton sweeps past down the straight towards the hairpin this time, and takes the position from Jenson Button. Up to sixth for Lewis now. Jenson Button comes in for his second pit stop of the afternoon. Soft tyres go on the McLaren. Hamilton, a little panicky on the radio, asking if there's anything that can be done, as he can't afford to lose the time it would take to change the front wing. He's told they will try to calculate "something." Fernando Alonso comes in for a pit stop, soft tyres on the Ferrari again. At the back, Kobayashi, Chilton and Kvyat all come in for their second stops. Sebastian Vettel is the next to dive into the pit lane, coming in from third place and rejoining sixth. He's got the supersoft tyres on now. Although Alonso pitted first, Vettel gets out ahead of the Ferrari, but Alonso sweeps past around the next corner. He locks up and lets Vettel back up behind him, but keeps the position for now. 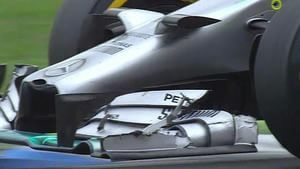 The damage to Hamilton's front wing. Hamilton sets the fastest lap of the race, immediately beaten by Fernando Alonso - 1:21.212. Felipe Massa: "I am very frustrated, because first of all, it’s a race that we had a good car, very good pace during the whole weekend. I even tried to be not so aggressive on the first corner, not to be fighting with my teammate on the first corner. I turn on his side, so I back off a little bit, so when he was in front, I start to do the corner and another car hit me on the side. There’s nothing you can do. Another DNF, another race we won’t score. It’s really disappointing." Rosberg has a healthy 15 second lead over the Williams of Valtteri Bottas. The top four drivers have yet to come in for their second stops. Fernando Alonso passes Nico Hülkenberg, who loses a position to Sebastian Vettel at the very next corner. Two places lost for the Force India in one stretch of track. Tweet from @clubforce: Nico, on old soft tyres, is passed by both VET and ALO who have recently stopped. Now in P6. And Nico Hülkenberg dives into the pit lane for his second stop, taking on some fresh rubber to help challenge for position. Race leader Nico Rosberg reports he's really struggling with the left front tyre, so he should be coming in for a pit stop any time soon. Before he does so, Valtteri Bottas takes his second stop of the day, a nice swift pit stop from the Williams crew. Lewis Hamilton has also reported front left wear, but his is due to damage on the front wing. He tells the pit wall: "This front left is not going to last." Nico Rosberg pits from the lead and rejoins in the lead. The gap to Hamilton is reduced to 4 seconds but Lewis is due to pit once more. Lewis Hamilton finally comes in for his stop. It's unlikely he can get to the end of the race on the super soft tyres, but it's the red sidewalls he's taken on. Daniel Ricciardo attempted a move on Jenson Button then, but it didn't work out and he's dropped back behind the McLaren again. Lewis Hamilton posts a 1:20.342 as he hustles to make up as much time as possible on these supersoft tyres. Sebastian Vettel pits from in front of him which also helps him out. Tweet from @Marussia_F1Team: Lap 45/67 | Jules still doing well on his older prime tyres. Just one stop so far to everyone else's two. Daniil Kvyat has pulled to the side of the track, the Toro Rosso is on fire! Huge flames. Kvyat is out of the car safely, but very angry and he punches the barrier in frustration. Yellow flags. The marshals move in with extinguishers to put out what were some pretty scary flames. The tractor moves in to recover the Toro Rosso, which is looking a sorry sight now. Moments before Kvyat pulls to a halt and jumps out. Nico Rosberg is informed they aren't expecting any rain before the end of the race. Just under 20 laps to go now. Lewis Hamilton pulls up behind Fernando Alonso just as DRS is re-enabled, and he easily moves past for third place. Yellow flags as Adrian Sutil spins on the home straight, and the Sauber looks like it's stopped right across the track. It's a really dangerous position for that car to be in, but Sutil is out and walking away. Will the safety car be called? Lewis Hamilton comes in for his third, and presumably last, pit stop, making best use of the slower lap times due to the yellow flags. The car has just been sat there for several laps, and now three marshals dash across and push it off track and to the run off. Brave guys. Daniel Ricciardo makes a pass on Nico Hülkenberg, who didn't give up easily, tried to get back in front, but ultimately had to settle behind the Red Bull. Ricciardo now up to seventh place. Kimi Räikkönen has pitted for the third time, and rejoins just in front of Sergio Pérez. But the Force India sweeps around the outside and takes 11th place. Fernando Alonso has also come into the pit lane, after the Ferrari driver was passed by Esteban Gutiérrez trying to unlap himself. The tyres don't appear to be lasting as long as anyone hoped, and thus Hamilton's adjusted strategy to a three-stopper isn't affecting him as much as it might have. Valtteri Bottas believes he can get to the end of the race on these tyres, though. Daniel Ricciardo sent Jenson Button the wrong way to defend, loitering on the right, then diving to the left to make the pass. Fifth place for Ricciardo. Fernando Alonso closes up to the McLaren now, with Jenson Button easy prey for the Ferrari on the harder tyres. Alonso passes Ricciardo, Ricciardo passes Alonso back. They are back and forth, scrapping for fifth place. Side by side into the stadium but not enough room to make it stick. And the battle is on again, as Alonso keeps tabs on the Red Bull, ducking and diving this way and that to try and find an opportunity. Bottas is told he can try to defend a little from Hamilton, but they're concerned about getting the tyres to the end of the race. Hamilton's front tyres are looking pretty worn as the inevitable pass on the Williams isn't looking quite such a sure thing now. Fernando Alonso passed Ricciardo heading down towards the hairpin, but then ran wide at the corner and allowed the Red Bull to try and regain his position. Alonso keeps the place for now. Williams have changed their tune, having seen that Hamilton is struggling. Now Bottas can try and actively defend their second-place position. The Williams/Mercedes battle is approaching traffic, with a Caterham directly in their path. Team radio to Kimi Räikkönen: "Their could be a drop of rain in one minute or so, but it will be very light." Kamui Kobayashi wasn't interested in that battle at all, he dived right off track to stay clear of the front runners. Hamilton manages to close up during the second half of the lap, but in the early corners of the first sector, the Williams can pull a little gap. "He's too fast on the straights," Lewis complains. Nico Rosberg wins the German Grand Prix! Valtteri Bottas holds on for second place, with Lewis Hamilton claiming the final podium position. Ricciardo followed Alonso across the line, so very close. Less than a tenth of a second between them. Team radio to Valtteri Bottas: "Amazing, that was fantastic. Beating a Mercedes fair and square. Great drive, Valtteri. P2." Nico Rosberg gets plenty of hugs and cheers from the waiting mechanics as he takes his home win. The space beneath the podium fills as the crowds move in to see the trophies handed out. The top three drivers head out onto the balcony - Lewis Hamilton has sunglasses on. Thankfully (for me) the rain held off, and we still had a brilliant race! Lots of tussling for position, lots of drama, and some great battles throughout the field. As the trophies are being lifted, I have to dash now, but do join me back here next week - back to back races will see us watching all the drama from Hungary before we head into the summer break. Thanks for always being awesome fact fans!